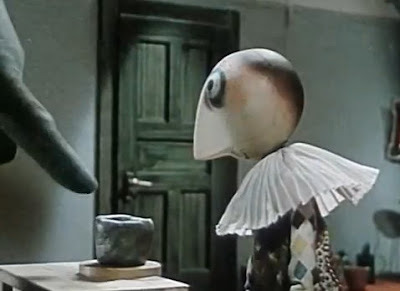 So here’s my second 1965 series possibility: 21 essays on Ruka (The Hand), a short animated film by Jiří Trnka. The Hand tells the artist what he should create in Jiri Trnka's Ruka. Following fifteen very productive years creating some of the world’s most charming movies, Czech animation genius Jiří Trnka courageously vented his political frustrations in his art. His final 18-minute short, Ruka (The Hand), is a very personal allegory of the artist versus the totalitarian state. Trnka’s puppet animation remains as sweet as ever, but the story is bleak and there’s no happy ending. The artist loses the struggle. It was Trnka’s last movie and the state predictably attempted to destroy all copies. While Ruka was Trnka’s favorite of his films and the one that has received the most critical attention, I actually don’t have a real favorite among his films—I love them all, from his Chekhov adaptation Story of the Bass Cello to his Shakespeare puppet feature A Midsummer Night’s Dream. Because of my natural temperament, I probably even slightly prefer his folk tales and literary adaptations. And yet I know that Ruka deserves to retain its place of honor. After all, it is Trnka’s final testament. As I cover other years, I’m sure I’ll be mentioning other Trnka films. He really is a favorite of mine. And at some point, I’ll have to choose which one will work best as a platform to discuss his art. Ruka would work, but I’d want to rein the essays back from being too political. Although Ruka’s political statement is clear and eloquent, it’s the character touches that I love most about it. Over the next two days, I’ll be proposing some more 1965 ideas (with no promises that I’ll necessarily be getting to any of them…). But I’m wide open to other suggestions. Any ideas for 1965 movies, books, short stories, poems, songs, paintings, or other cultural artifacts that might inspire a good 21 Essays series?